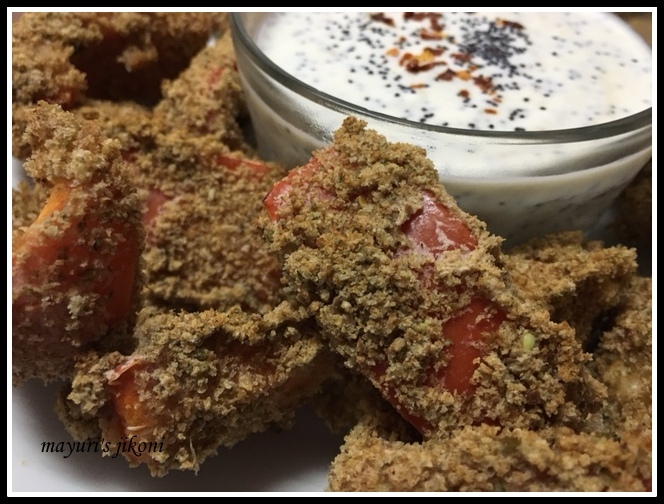 For the January Shhh Cooking Secretly challenge, my partner Veena Krishna Kumar of Veg Nation challenged me to cook with bell pepper (sweet pepper) and poppy seeds. I nearly asked her change the bell pepper. No don’t get me wrong, bell peppers are so versatile that one can make anything with them. The only reason I wanted her to change it was because hubby dear is allergic to them. Well, he doesn’t break out into a rash or anything but feels that it upsets his stomach. But I love bell pepper, so thought that I really don’t have to make something that he will like or appreciate; some day it has to be my choice too. So I decided to work with the given ingredients and was trying to think of something healthy. Salads are healthy, but I had this crunchy cauliflower bite recipe bookmarked for a while. So decided to make both sweet pepper and cauliflower to make the wonderful healthy bites.Cauliflower ones for hubby and sweet pepper ones for me 🙂 I baked the bites instead of frying them and hubby dear actually wanted the fried ones! Come to think of it, with the basic batter recipe and the breadcrumbs, you can use a variety of vegetables… boiled sweet potato or potatoes or pumpkin cut into thick fingers, carrots, zucchini, mushrooms etc. Let your imagination wonder and try out these healthy bites for your family. Wash the cauliflower and pepper. Dry it with a kitchen towel. Cut the cauliflower into bite size pieces. Cut the pepper into thick long strips or bite size pieces. Line a baking tray with parchment paper and drizzle a bit of oil over it. Mix the ingredients for the batter together in a bowl. Mix breadcrumbs and herbs and put the mixture in a plate. Dip the bite size vegetable into the batter to coat it completely. Put it in the plate with the breadcrumbs and coat it. Place the coated vegetable piece onto the prepared tray. Repeat steps 7-9 with the remaining pieces. Put the tray in the oven to allow the cauliflower and sweet pepper to bake for 15 minutes till it becomes golden in colour and crunchy. While the veggies are baking, prepare the dip. Mix all the ingredients for the dip in a bowl or a jar. Keep it in the fridge till required. Remove the baked veggies from the tray and serve along with the yogurt dip or a dip of your choice. To prepare fresh home made breadcrumbs, process 2-3 bread slices in a food processor (chopper) till you get fine breadcrumbs. Spread the breadcrumbs on a baking dish. Put it in the preheated oven (100°C or 150°C) and let it bake for 5-7 minutes or till it becomes crispy. Let it cool for a while and then use the breadcrumbs for coating. Use a herb of your choice. Add spices to the batter if you like. If you would love to join our shhh cooking secretly group, please get in touch with me or Priya at Priya’s Versatile Recipes. It is crunchy and one can make it delicious by adding herbs and spices of their choice. These look delicious and would make a perfect party aperitifs . Nice and healthy snack ..and the dip looks very nice too. I have never used poppy seeds in any dip. Will try it out.